Burger Battle at Left Bank! Wondering what this week's Burger Battle at Left Bank Burger Bar is? While I haven't tried either of these burgers, I love the experiments that Left Bank keeps coming up with. If you're unfamiliar with the Burger Battle, let me explain. Each week, Left Bank comes up with a flavor concept, creates a burger with the appropriate toppings, and pits it against whatever the previous week's winner was. The winner is determined at the end of the week based on how many orders there were of each burger. And here are this week's contenders! Several weeks ago, I went to Taqueria Downtown for the first time in a long time and when I was there, I saw they had some new additions to the menu including several new fillings for tacos like beef tongue, flank, and head. However, I decided to really go outside my standard order (tacos. always tacos.) and try the tortilla soup. 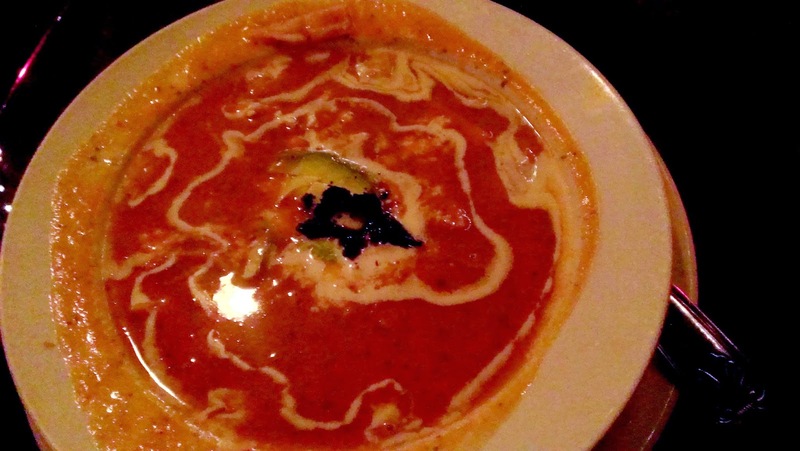 I've always liked tortilla soup, but this was far and away one of the best I've had. The Hamilton Inn and Union Republic are extending their brunch hours through tomorrow for Memorial Day and 9th and Coles will have a special menu to kick off "Hot Dog Season"! Thirty Acres has introduced a new brunch menu. Razza and Porta are hiring! This past Sunday, 6th Borough Market moved to their new home at the lot across from City Hall and the market at the new space proved to be bigger and better than ever. Beyond the usual wonderful crafters and vendors, there were several new (or at least new to me) food and drink suppliers with both exciting new products to take home and to enjoy there. While I was tthere, I picked up two bottles of all natural hot sauce produced by a company in Bayonne called Outer Limits. One is a Jalapeno Lime and the other is their Habanero hot sauce. I was able to taste them there and both packed quite a bit of heat, the Habanero especially, but beyond the spice, they also had a strong peppery tang that I immediately imagined adding a nice flavor pick-up to dishes. Congratulations to The Thirsty Quaker who celebrated their Grand Opening today with a barbecue and ribbon-cutting ceremony. Congratulations are also in order for Tea NJ who will be celebrating their Grand Opening on Friday, June 13th at 2:00pm. There will be an array of tea tastings available for those attending. Milk Sugar Love has started stocking The Warehouse Cafe with organic Intelligentsia coffee ice cream and chocolate chip cookie ice cream sandwiches! Jersey City weekends are the best weekends! Coming up, we have Surf City reopening tonight, May 15th and on Friday, they're officially kicking off the grand reopening with a First Friday party. Get ready to enjoy the first signs of summer! Thursday is also the second day of the HDSID Farmers' Market at Grove Plaza with all your favorite farms and stands. The Taco Truck, The Cinnamon Snail, Stella's Empanadas, and more will also be there serving up delicious food. Surf City will re-open this Thursday, May 15th at 4:00pm with a kick-off party on Friday, May 16th. They will only be open Thurs. - Sun. until June 1st when they will be open every day. Metropolis Nights featured two Jersey City hotspots in their most recent issue! Brian Dowling from Park and Sixth Gastropub is featured as their Chef of the Month and Kelly Rose Lynch and Laura Miller from PJ Ryan's were selected as Bartenders of the Month. Congratulations to all! Tomorrow, Monday, May 12th marks the reopening of the HDSID Grove St. Farmers' Market! Another weekend is here and once again, there's plenty to eat do in Jersey City, especially if you're looking for ways to celebrate Mother's Day. On Friday at 4pm, join Roman Nose for their ribbon-cutting ceremony with the mayor and as they kick-off the weekend with their new Ora Felice Happy Hour. You can also get an early jump on Mother's Day by checking out Madame Claude Wines on Friday as they host the launch for ZenGarage's Mothers Day Collection. There will be wine and brazilian cocktails for tasting! 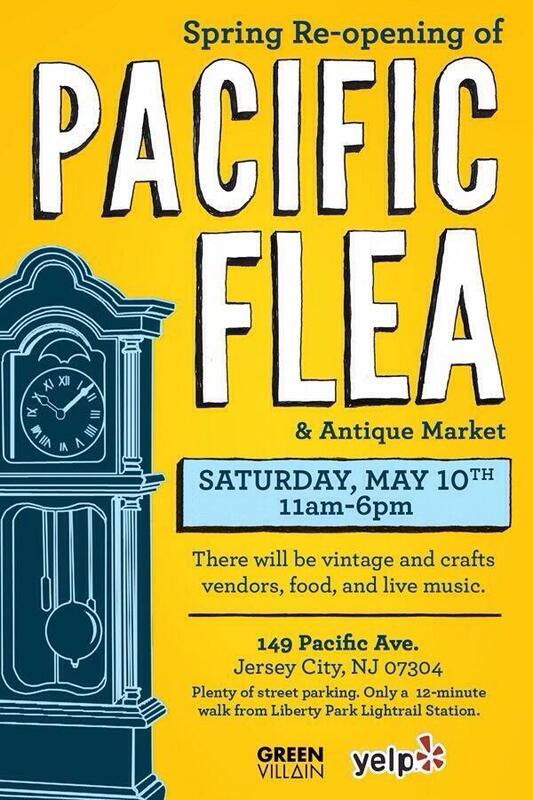 This Saturday is the re-opening of Pacific Flea for the season, and to celebrate, they're having a special celebration including crafts, live music, and of course, food - the Grill Guyz are going to be there and since they're not often in downtown jersey city, this is an ideal time to check them out. And pick yourself up something awesome. Roman Nose, conveniently located right by the Grove Street Path, is a fairly casual and family-friendly Italian restaurant that focuses on serving authentic home-style meals. While not exactly brand-new, the restaurant still feels like a relatively new addition to Jersey City, partially because of their recent remodel. The new bar area adds a welcoming touch and the space is very nice; intimate but casual and while it can get crowded, I didn't feel like I was right on top of the other customers. Not long ago, I stopped in for a casual dinner with some friends. We were waiting for two more people to join us who took longer than expected, but the staff was very friendly and calm about it. They went ahead and seated us and didn't act as though it was a problem which we appreciated. However, throughout the meal, I found our service to be a bit disorganized and slow. We had to ask for wine a couple of times, our food took quite a long time to come out and it felt like we were alternately being left alone for long stretches of time or checked on four times in a row by different people. Those issues aside, I found it to be a welcoming and friendly atmosphere and think they probably just need to work on organization a bit. 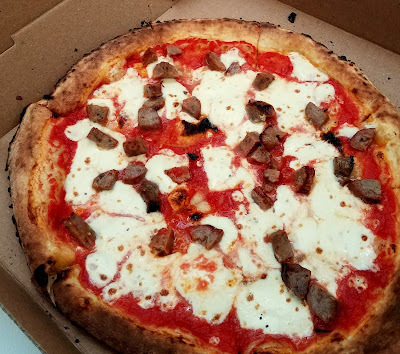 As for our actual meals, we pretty much stuck to the basics: salad, meatballs, and pasta although it was hard to say no to several of the delicious-sounding and much-buzzed about pizzas. 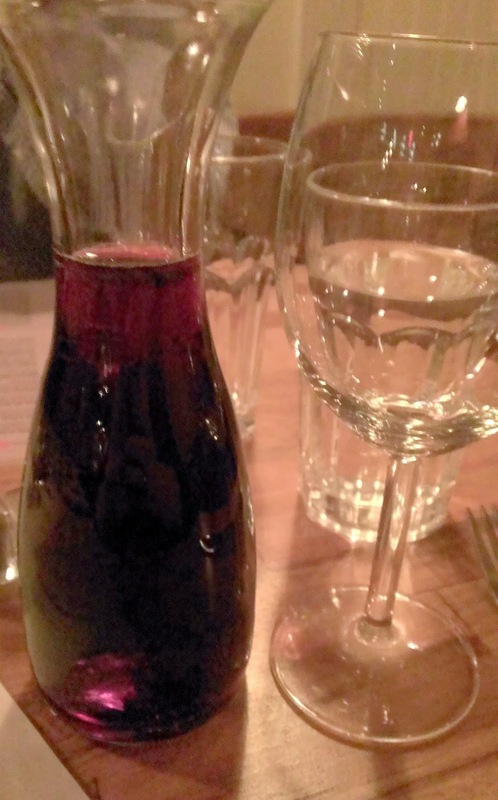 I did have a glass of wine which was served in a small carafe and proved to be an exceedingly generous pour, especially for the price. While I wouldn't call the drinks menu expansive, it was pretty well-rounded for a restaurant this size and I'd say there's something for everyone. 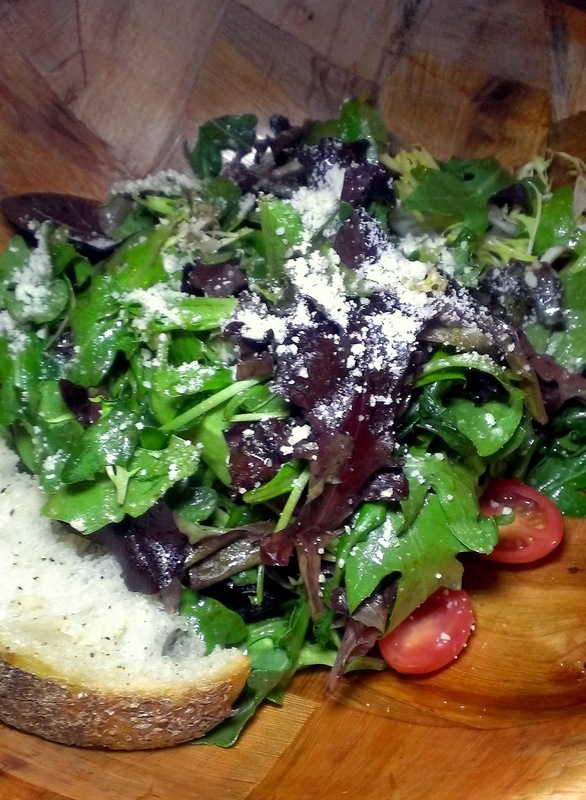 We started with the house salad which was made with very fresh mixed greens (heavy on the arugula), cherry tomatoes, and a decent sprinkling of Parmesan, all tossed with a simple but tart vinaigrette. I'm a big fan of the peppery flavor of arugula which was complemented by the slight salt of the cheese and the vinegary tang of the dressing. I loved that it came in a large wooden bowl which felt familial and comforting and contained enough to feed a small army. Congratulations to all those who participated in the Chili Cook-Off and thanks to 4th Street Arts for their hard work in putting it on! It was a fun and food-filled good time. To read all about it, including who won, check out judge Peter Genovese's article. Choc-O-Pain has some new bakery items ready for Mothers Day, including an indulgent-looking chocolate ganache tart with strawberries, so start placing your orders now. Trolley Car Bar and Grill has started offering brunch on the weekends beginning at 12pm. Barcade is now offering a free app that tracks tap lists, events, and scores. However, for right now, it looks like it's only available for Apple through iTunes. 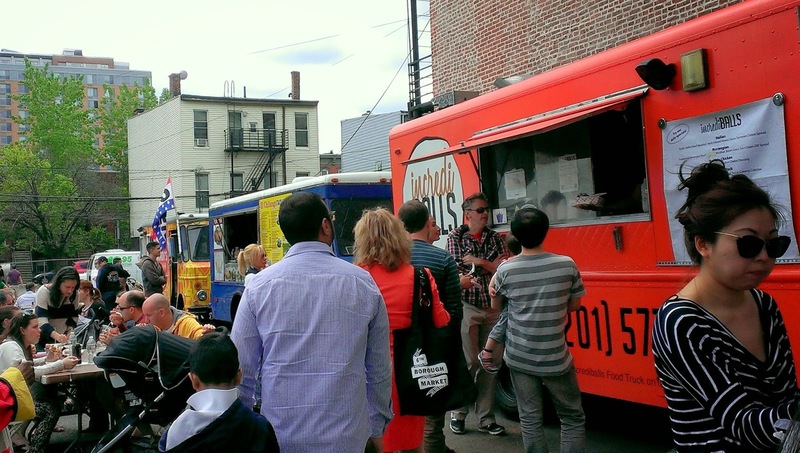 If this first weekend of May is any indication, Jersey City is in for a great month! There are tons of events and parties happening all around town, so start figuring out your schedule right now so you can hit as many as possible.